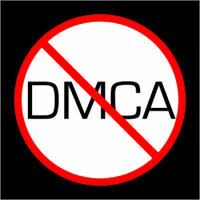 In one of the most important and controversial aspects of the DMCA, any technology which is designed to circumvent copy-protection schemes, no matter how simple, is illegal. This has strong implications for the fair use aspect of US copyright law, which provides the consumer with the right to make copies of copyrighted material for personal use. In other words, if a manufacturer installs copy-protection in a product, the right to copy is guaranteed, but the ability to copy is prohibited. If only they would make copying discs you don't own legal, that would rock. Don't go getting greedy now. ok so what about the titles you rent from a video store could you back those up legally as well? If that goes through would out favorite programs still be free ware? Who knows... but if you got freeware now, and they try to charge for it, then use the one you have! I got stuff back from Ulead Video Studio 7 free trial and other 'oldies' like that. So if they try to charge me for it, I just use the installers I have. I bought the set of "Lord of the Rings" for $68.00 + tax. I love the set, the pictures. One of my friends came over and borrowed the set, and he kept for like ...over a year. when I got it back the set was ... terrible (I had no ideas what he did, or maybe his children or anyone, to the set, the book of picture, dvds scrached, there was "brown" marks on the dvd which I believed it was coffee....). I love the movie, and want to keep it nice. I purchased another set. but you know, I can't do this more than 2 or 3 times. Not sure on this one, I think if he keeps it it would be illegal for YOU as he has the originals and you have copies. If he gives them back, it should be no problem. BUT this is not set in stone, in fact we are not supposed to give legal advice, so heed that warning. When in doubt....don't do it. I'd play it safe and not give a back-up to anyone, although letting him use the original has obvious drawbacks. Tell him to dump coffee on his own $60 movie. not enough money is budget to police that kind of thing. i wouldn't worry about letting people borrow dvd's as long as you own the original and you are truly letting them "borrow" it. but like the supercenter says i'm no lawyer.